Most robo-advisors compete fiercely to invest your money by rolling out an extensive range of services, including digital and human advice, retirement calculators, and mobile financial apps. But few cater to retirement investors who aren’t quite sure whether their 401(k)s are being managed adequately. And that has left a gaping market opportunity for a digital money manager called blooom, which was started by three guys from the mid-west. blooom is unique among robo-advisors because it specializes in managing 401(k) accounts that so many robo-advisors overlook. Unlike robo-advisors who require you to transfer assets, blooom simply connects to defined contribution plan accounts you already have, so getting started with blooom is easy. Another brownie point for blooom is its pricing. Unlike most robo-advisors that charge a fixed % of assets under management, which may leave you scratching your head trying to figure out how much you pay in fees, blooom charges a flat monthly rate of just $10. Plus, blooom stipulates no account minimum so small accounts can benefit right away and individuals with large account sizes get a whole lot of bang for their buck. Which Accounts Does blooom Manage? How Safe Is Your Account With blooom? blooom (with three “o”s) is laser-focused on optimizing 401(k) plans for Americans. Unlike most other robo-advisors who generally cater to taxable accounts, traditional IRAs, Roth IRAs, and SEP IRAs, blooom exclusively manages 401(k) plans. If you have a chunk of change that you want to invest at low cost, a bunch of top notch robo-advisors will crop up on your radar screen. But most of these companies focus on standard taxable accounts as well as traditional IRAs, SEP IRAs, rollover IRAs and Roth IRAs. Where blooom stands apart from its rivals is its focus on defined contribution plans. What comes as a shock to many 401(k) investors is that their investment representatives and fund companies don’t actually manage their money on their behalves. When you first sign up with those companies, you would have picked the percentage allocation to invest in each fund, and if you’re like most people that selection process was probably random. It is not uncommon for many 401(k) investors to choose an allocation and forget about it as time goes by. For most retirement investors, 401(k) investing is a murky world of fees and uncertain fund choices. The funds you invest in have expense ratios that eat away at your savings year after year and the allocation may be less than ideal, but how do you really know? blooom has the ambitious goal to “fix 401(k)s for EVERY American” and it’s off to a flying start with over $500 million in assets managed. The idea is to make 401(k) help smart, simple and easily available to all Americans. 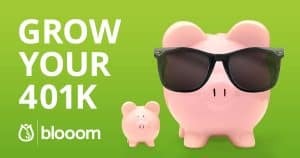 To get started, connect blooom to your existing online 401(k) account. blooom analyzes your 401(k) holdings and makes changes within 10 to 30 days. Thereafter, blooom monitors your account regularly and notifies you when it automatically rebalances your portfolio. When you sign up with blooom, your assets stay put. You don’t have to deal with the hassles of transferring funds to get started. Unlike many other robo-advisors, which take custody of your assets, blooom simply links into your existing 401(k) accounts. As long as your account is online, blooom can get to work right away evaluating your 401(k) holdings. The best way to think of blooom is as a digital manager that is constantly reviewing your 401(k) account holdings to check whether your allocations match your risk profile and the algorithm is looking for ways to lower your costs. Once you link your account to blooom, it takes anywhere from 10 to 30 days for blooom to “fix” your 401(k). The heavy lifting of account analysis at blooom is done by computer algorithms in an automated way but licensed advisors and blooom account coordinators test and confirm rebalancing is accurately completed. After changes have been made, blooom regularly monitors your account to check whether changes are needed, and takes action on your behalf so you don’t have to lift a finger. Each time changes are made, you will be notified by email so you won’t be surprised when you receive your 401(k) statements in the mail with new portfolio selections. Where blooom shines even more brightly is that if specific questions about your 401(k) do crop up, you have access to experts via live chat, email or phone. So far, only individual accounts are managed by blooom. Families will need to sign up separately to ensure each account is diversified, and each family member has their own blooom profile, including age and target retirement date. For investors seeking automated investment management of taxable accounts, traditional IRAs, Roth IRAs, SEP IRAs, rollover IRAs, and Trusts, robo-advisors, such as Betterment, will be a better fit. Most robo-advisors charge a percentage of assets under management. For example, Betterment and Wealthfront both charge 0.25% annually for purely digital advice. Schwab Intelligent Portfolios is unique in charging no management fees because it makes money from expense ratios of proprietary funds which make up client portfolios. And financial industry goliaths, such as Vanguard and Fidelity, also offer robo-advisor services for an annual fee which is a percentage of assets under management. By contrast, blooom charges a flat monthly rate of $10. No matter what the size of your account, the flat rate remains the same. You won’t find any hidden “gotchas” in their fee schedule and you can cancel anytime. Even though $10 monthly seems like a low amount at first glance, it can add up to a hefty annual percentage amount for those with smaller accounts. For example, $120 per year on a $3,000 401(k) account size would equate to 4% of managed assets, which is significantly higher than you would pay at Betterment for example. For individuals with $50,000 or more in retirement savings in a 401(k), blooom is an obvious win. You pay lower fees than at most other robo-advisors and don’t have to worry about the hassles of transferring assets to another custodian. 256-Bit Encryption SSL encryption is used to keep data private. Bank-Level Security High level security is applied to all personal information. Secure Servers Encryption is used to ensure online transactions are secure and data is kept confidential. 24/7 Hacker Virus Scans Around the clock scanning is designed to protect you from fraud and unusual account activity. 3rd Party Verification To make sure your identity is not compromised, third party verification is used. Most robo-advisors incorporate Nobel-prize winning research, called Modern Portfolio Theory, into their algorithmic selection of funds when building client portfolios. Generally, this means targeting returns that match your risk profile. Younger investors with longer time horizons can invest more heavily in stocks while individuals closer to retirement have higher weightings of bonds usually. blooom doesn’t look to reinvent the wheel when it comes to investment selection but instead modifies portfolio allocations to align with target risk levels. If your portfolio is weighted too aggressively in equities compared to your financial goals, risk profile and time horizon, blooom makes the necessary adjustments. A challenge blooom faces is the limited investment choices available. Unlike an IRA or standard taxable account, 401(k) accounts are limited by a set number of funds that your employer plan sponsor makes available. So, blooom looks to optimize your allocation based on the choices available rather than the universe of all stocks and bonds. 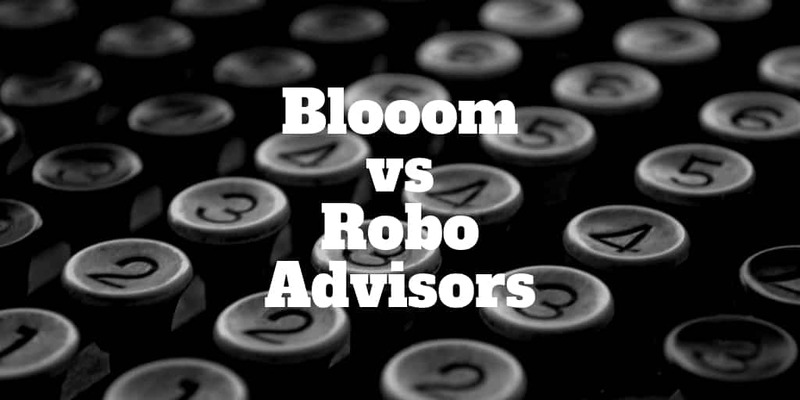 blooom stands apart from other robo-advisors in three primary ways. First, blooom specializes in 401(k) accounts and defined contribution plans more generally as opposed to taxable accounts and IRAs. Secondly, blooom does not take custody of your assets but instead links into existing online retirement accounts where your 401(k) is managed and monitors allocation and fees digitally using proprietary algorithms. And finally, blooom charges a flat rate monthly fee instead of a percentage of assets under management, which offers compelling value to large account sizes because fees do not increase proportionately as they do with most robo-advisors. For any retirement-focused investor who is serious about optimizing their 401(k) holdings, blooom is our top choice digital manager.